In addition to Small Duct High Velocity systems, SpacePak also offers a full line of high-efficiency hydronic solutions. Unlike forced air systems that exclusively use fossil fuels and refrigerants, hydronic systems use water as the medium for heating and cooling. Most hydronic systems that feature a water-to-water heat pump are limited to heating-only. 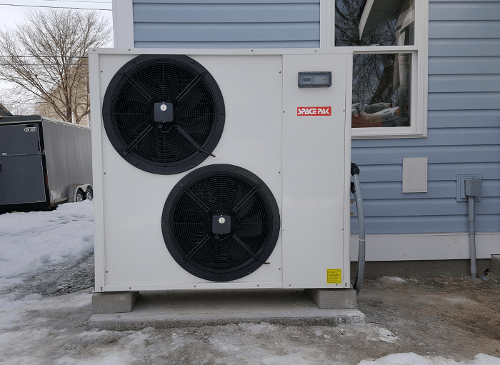 SpacePak’s Solstice series are true air-to-water reverse cycle heat pumps that can alternate between heating and cooling, providing your family with an all-in-one home comfort solution. During the heating season, heat pumps absorb energy from the outdoor air and transfers it into your home. Even at sub-zero temperatures, outdoor air contains substantial heat that our Solstice pumps can use for central heat. Conventional systems have to "create" the heat energy for transfer with natural gas or oil based combustion, which is a far less efficient process than an electric heat pump simply "moving" the heat energy. Unlike other water-to-water heat pump systems, the Solstice can absorb heat from inside and dissipate it outside, leaving your home cool and comfortable. Using water as the heating or cooling medium requires significantly less energy while keeping all refrigerant outside of the home, resulting in superior performance in an ultra-safe and environmentally-friendly fashion. Hydronic systems offer ultimate design flexibility, and allow homeowners to design a system around their specific needs, regardless of the local fuel source. 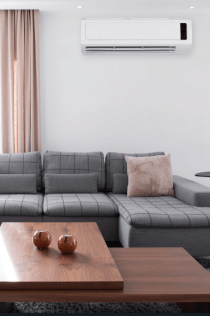 Our heat pumps are perfect for zoning, allowing multiple thermostat-driven zones to provide heat as well as cooling, exactly where and when you need it. The result? Even more efficiency and substantial cost savings. 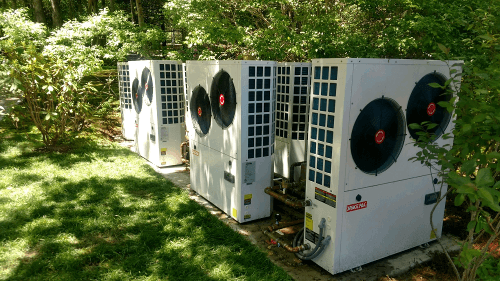 Solstice Heat Pumps can easily integrate with other existsing systems, making it a perfect choice for remodels or new construction with limited space. With a compact design, the Solstice can be installed at ground level, on rooftops, raised platforms, or under decks. Unlike traditional refrigeration systems, utilizing water for the transfer of energy allows our heat pumps to be in mounted in remote locations far away from the building. 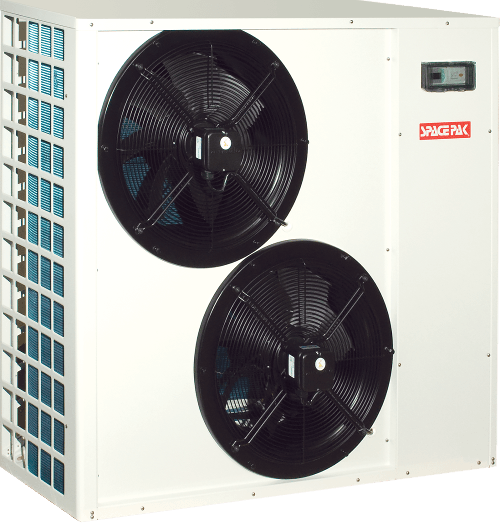 Solstice Heat Pumps can match with SpacePak Small Duct High Velocity Air Handlers, SpacePak Hydronic Highwalls and Thinwalls or take advantage or radiant flooring and low temp baseboard application. Hydronic technology has long been known for providing unsurpassed heating comfort. New innovative technologies have allowed hydronic equipment manufacturers the opportunity to provide complete packaged solutions for both space heating and central cooling using the known advantages of hydronics over that of traditional forced air systems. Using the same physical properties that make water ideal for conveying heat also make it ideal for conveying cooling. Click the features below to learn more about our Hydronics technology. 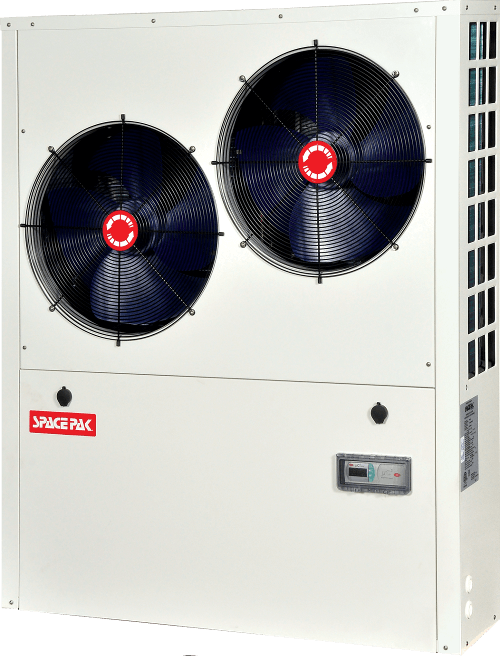 SpacePak Solstice Air-to-Water Heat Pumps accomodate almost any home, in any climate. Their environmentally-friendly design and the clean efficient characteristics of hydronics as its primary energy source will deliver whole house comfort - whatever the weather may be. Hydronic Systems that feature a water-to-water or "ground source" heat pump, are limited on cooling capacities and more of a heating product. SpacePak's Solstice series are true air-to-water heat pumps that can alternate between heating and cooling, providing your family with an all-in-one home comfort solution. 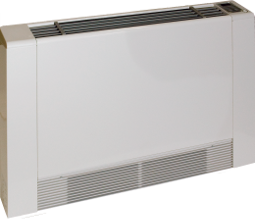 The Solstice SE is our standard air-to-water heat pump model, and is ideal for mild climates. The Solstice Extreme provides primary heating and cooling even in severe weather climates. Up to 30%-50% lower installation cost when compared against Geothermal systems. Keeps refrigerant outside the home and utilizes a condenser coil that is 30% larger than standard units, improving efficiency. Allows custom control not obtainable by most traditional refrigerant-based systems. Utilizes adjustable water flow, water temperature, and airflow settings, giving you complete control of the system and each temperature zone. Features an intelligent factory-configured control platform, with a self-diagnostic microprocessor that keeps your system running seamlessly. Water-to-water heat pumps, or geothermal heat-pumps, work by installing multiple “earth loops,” or water lines, throughout your front yard. Expensive to install, especially if vertical bore holes are required for the earth loop, or if you’re connecting multiple earth loops to the heat pump. Most water-to-water heat pumps can only heat your home, but have limited cooling capabilities. Horizontal earth loops require large land areas and major excavation, and most jobs require re-landscaping your yard. Depending on your region, drilling may be necessary for installation. 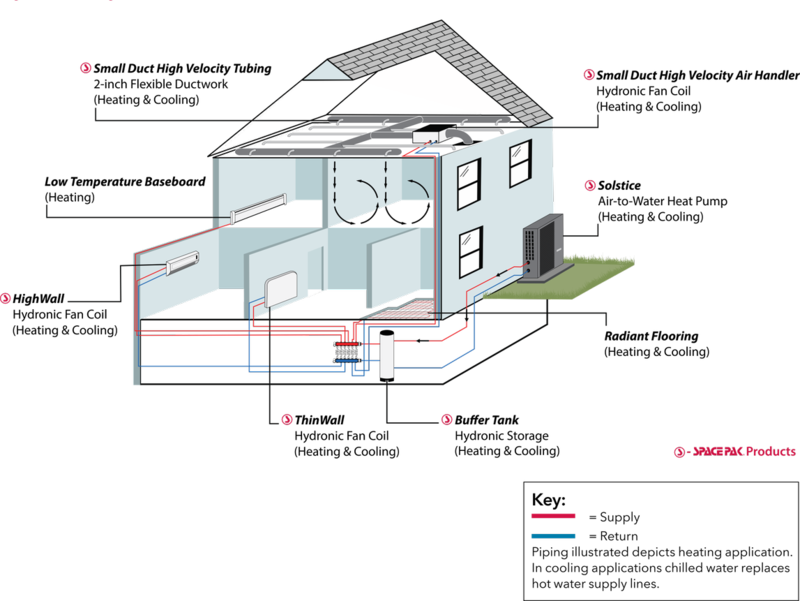 While most geothermal heat pumps claim to be highly efficient, this usually doesn’t include the power required to move flow through the earth loop, which can be substantial. The historic First Presbyterian Church of Lancaster, PA needed to replace two 50 ton chillers. Limited area surrounding the building presented extreme challenges in getting a large unit to the roof. 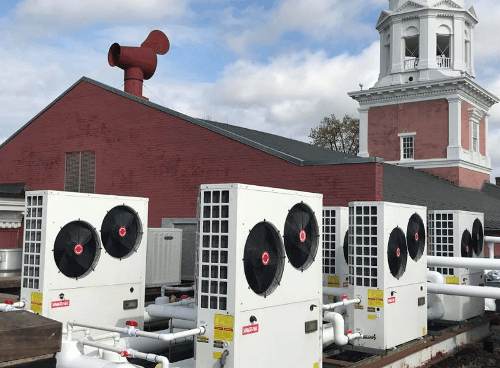 Instead of renting a crane and shutting a street down, the Solstice’s compact design made it possible to take the 21 Solstice SE Heat Pumps up the church's elevator to the roof and provide the 105 tons of heating and cooling demanded. This year, SpacePak teamed up with the Rutland, Vermont chapter of Habitat for Humanity in support of their most recent project to build a new and highly energy efficient home for a family in need of affordable housing. 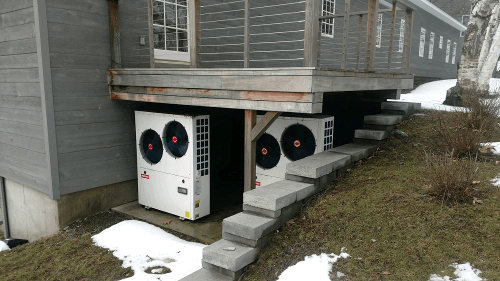 Efficiency Vermont, the state’s objective advisor on saving energy through efficiency, identified SpacePak’s cold-climate-tested air-to-water heat pump as the ideal solution to deliver affordable heat energy to the home’s hydronic heating system. The house was also equipped with radiant tubing in a concrete slab on the first floor, and baseboard tubing on the second floor. The system consists of two zones, each controlled by a separate thermostat on each floor, allowing the family to program the home’s temperature settings and further reduce their utility bills.